The fatal police shooting of a Nigerian man has sparked outrage and reignited a public call for the shutdown of a controversial police unit in the country. 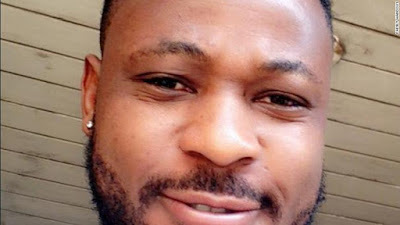 Kolade Johnson was shot by officers with Nigeria's anti-cultism police unit during a raid in Lagos on Sunday, according to a statement from the Nigerian Police Force. Members of the unit were searching for a suspect and at one point fired into the air, Johnson's family and lawyer told CNN. The 36-year-old father and a friend were leaving a soccer viewing center in the area, where they had gone to watch a Premiership league match, when a stray bullet hit and killed Johnson, his family and lawyer said. Johnson died at the hospital while waiting for treatment, according to his sister Toluwani Lukman. Lukman said her brother was dedicated to his family and had just returned from South Africa, where he had lived for five years to focus on his music career. "He had saved up some money while working in South Africa and he returned to Nigeria to start his own music label. He was just getting back on his feet. I can't believe he is gone," Lukman told CNN. Johnson's killing provoked widespread anger among Nigerians, who said the police unit had gone rogue and should be disbanded immediately. High-profile Nigerians including Nollywood actors, politicians and celebrities took to social media, calling for justice. Police in Lagos said the officers who fled the scene after the shooting were identified with the help of eyewitnesses. "Members of the team suspected to be involved in the shooting have since been arrested and are currently in police custody undergoing interrogation," Lagos police spokesman Bala Elkana. Nigeria's Presidency sent its condolences to the family in a post on Twitter and said the Nigerian police have assured the government that the members of the unit involved in the shooting were under arrest and were facing disciplinary measures. Lagos State Commissioner Zubairu Muazu also paid a condolence visit to the family Tuesday and assured them their would be justice. Nigeria's police force also shared photos of two police officers wanted in connection to the shooting. But this has not stopped the growing calls by citizens and rights groups for a shutdown of the police unit. In August 2018, Nigerian Vice President Yemi Osinbajo ordered an overhaul of the country's Anti-Robbery Police Squad (SARS), which was accused of torture, extortion, widespread brutality and even murder. Osinbajo, who is also a law professor, promised a total reform of the controversial police unit and vowed to prosecute those found guilty after investigations. Amnesty International Nigeria, which has long campaigned for the disbandment of the SARS police unit, said Monday the vice president's reforms have been "ineffective." The rights group alleged that the police unit was still torturing many citizens and restructuring was not enough to stop their atrocities. "Police torture is a stain on Nigerian society that must be addressed with clear orders to law enforcement officers not to inflict torture or other ill-treatment on detainees under any circumstances," Amnesty International Nigeria said. A spokesman for Osinbajo, Laolu Akande, said it was hasty to describe the ongoing police reforms as ineffective. "We are firmly committed to ensuring these reforms are fruitful. In the particular instance, we will ensure that justice is served," Akande told CNN.